Happy Monday! It has officially turned fall in Oklahoma. This very chilly weekend included lots of quality time snuggled under a blanket on the couch. We woke up Saturday morning to find our house was a very chilly 53 degrees F, so we turned on our heater for the first time this season. It was a relaxing weekend that included lots of fun times in the kitchen. I made homemade pizza, veggie chili and cornbread, a yummy apple tea cake (using a recipe I found in one of my mother-in-law's Australian cookbooks this summer), and some fun snacks for this afternoon's Cookie Club. I can't share any delicious baked goodies with you, but I can share with you the tweets and blog posts I enjoyed this week. 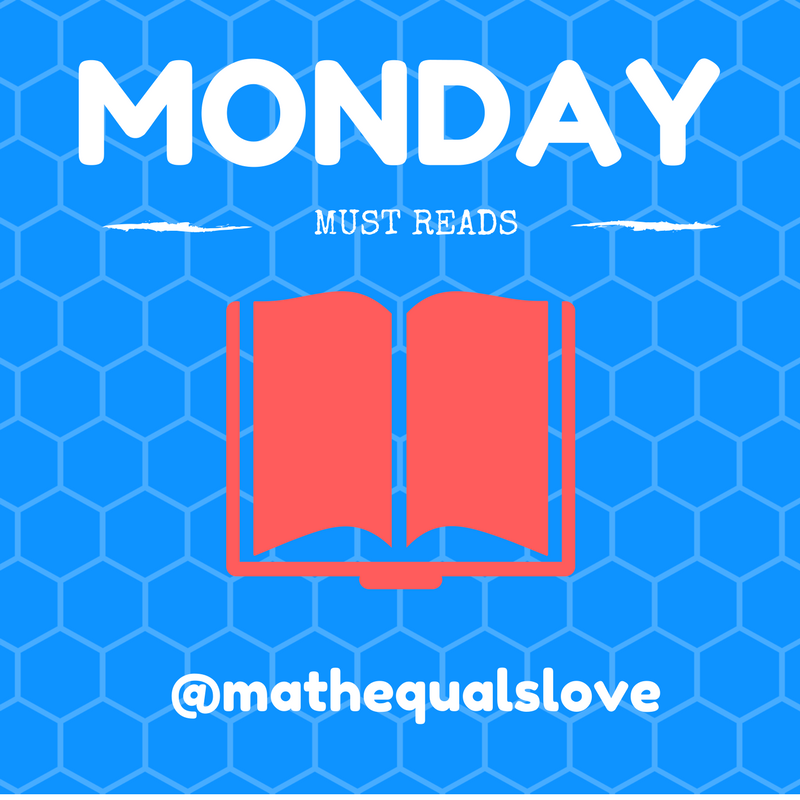 Here are this week's must reads! Sarah Martin shares a nifty desk set-up. Each desk has a command hook holding a dry erase pocket (affiliate link) and magnetic eraser. 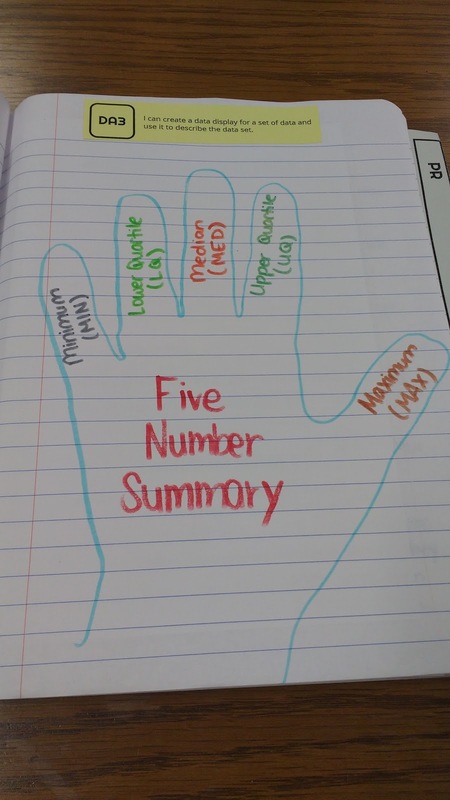 I love how this gives each student access to the tools they might need at a moment's notice. 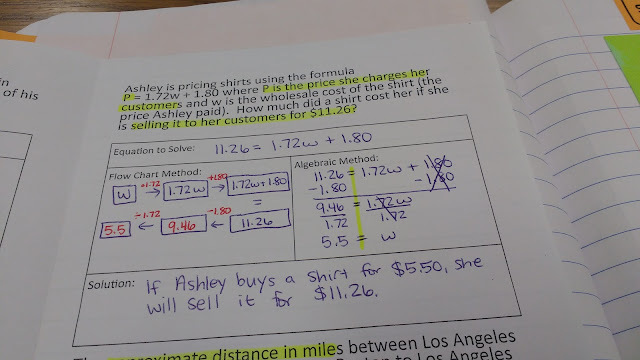 Every year, it is a struggle to get my Algebra 1 students to wrap their heads around domain and range. As a result, I'm super excited about an activity recently shared by Elissa Miller. Beginning with finding the domain and range of simple boxes is brilliant, and I'm kicking myself for not thinking of it! I love having classroom auctions. In the past, I've blogged about hosting a solving equations auction, a function auction, and a linear auction. Jae Ess shares her own awesome auction about real numbers. RupeleMX makes ionic bonding come alive by engaging his students with jumbo ion pieces. Last year, I used mini ion pieces with my physical science classes. This year, I'm going to have to step up my game! Jazmine Castanon is an expert at getting students out of their seats and learning. 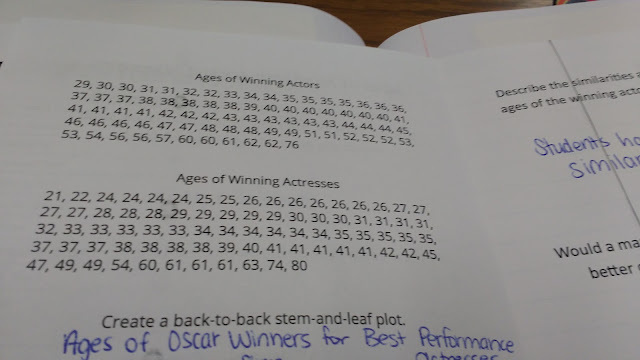 I love how she took her class to the hall for some bowling to collect some fun stats data! 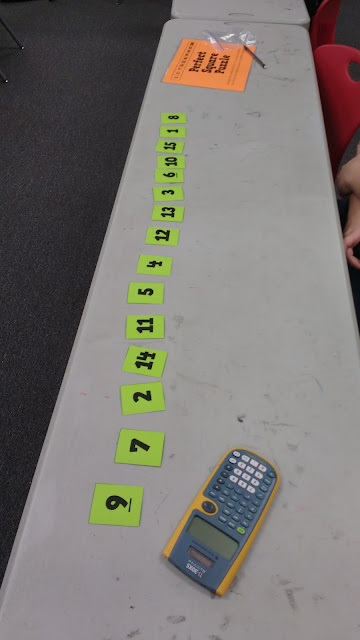 Langdon Park Maths shares an awesome way to organize solutions to the four fours puzzle: a hundreds chart! 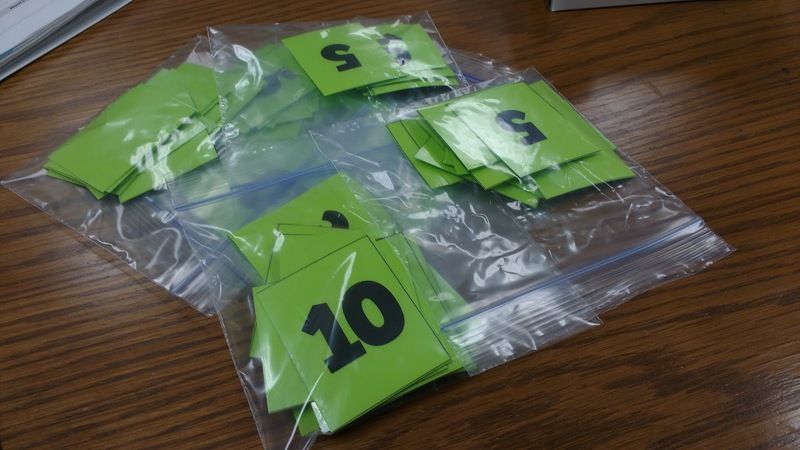 Lora Kermode shares an intriguing activity for combining like terms using sticky notes. Also, the posters and anchor charts on the wall are GORGEOUS. Mr. Cotter poses a fun problem involving creating a net for a cube. David Butler continues to blow our minds with his mathematical creations. You MUST click through to watch this video here. Don't trust me? Trust the 969 likes and 313 retweets on this video! Jennifer Williams offers up a blog post about a creative activity: slope and intercept war. 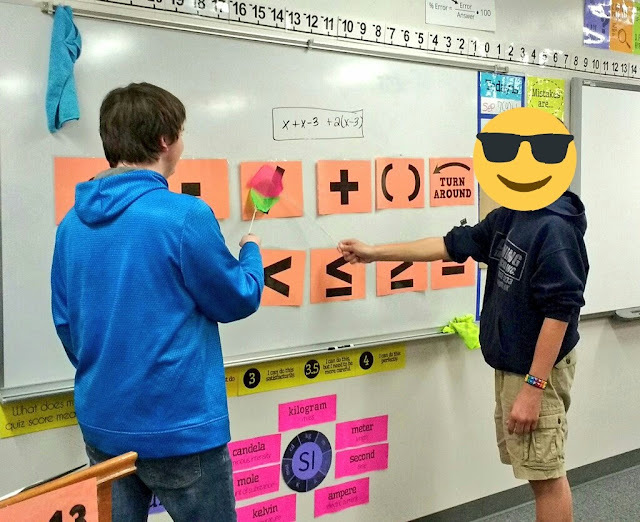 I absolutely love the fact that students have to deal with different representations of linear functions in this activity. Michelle Bagley has created one of the most creative review games I have ever seen! I need to make my own tetris pieces so I can recreate this in my own classroom! Sarah Costley makes some brilliant modifications to the interactive notebook number lines (horizontal and vertical) that I shared on my blog. Amanda Thom shares an interesting fact about the symbol for perpendicular lines. Liz Mastalio combines dice with linear functions to produce a fun practice activity. I find that my students' engagement level goes way up when the problems are randomized using dice! 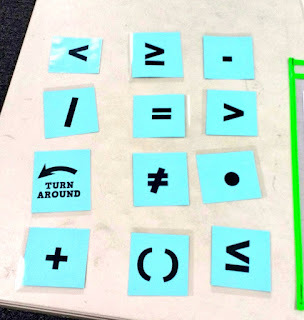 Liz has generously shared her templates here on her blog. Lori B Knox shares a fun linear regression project. After seeing many teachers use this project over the years, I've finally decided this is the year I will try it! Dr. 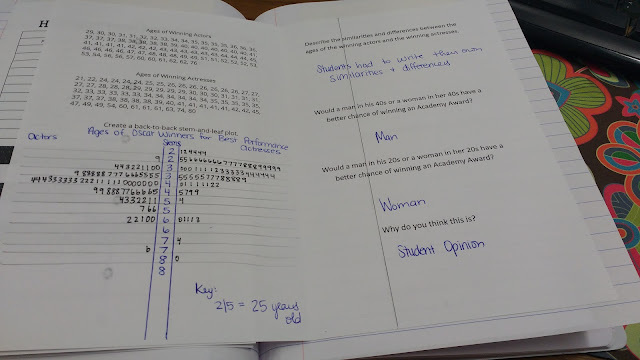 Males offers a fun, visual activity for working with cubic expressions. Mrs. Mongelli brings chemical bonding to life by having students act it out using wiffle balls as electrons. Maybe I'll finally get to use the ping pong balls I bought a few years ago at Target's Dollar Spot! Maria Riverso takes visual patterns to the next level using two colored counters! Sara Goldrick poses a fun estimation problem. I love that she offered the winner a box of cheese square snacks as their snack! Jenny Leake shares a fun puzzle that she solved at the #SUM2017 Conference. Intrigued, I did a google search and found a blog post from David Butler. This will be making an appearance on my puzzle table this week! As a fifth grader, my classmates and I always looked forward to the days where the flyswatter game was on the agenda. Mrs. Murray, my teacher for science and social studies, would use the game to help us review our vocabulary words at the end of each chapter. Each vocab word would be written on the dry erase board. We would form two lines in front of the dry erase board. The person at the front of each line would be given the coveted fly swatter. Now, these were special fly swatters that were only to be used for this game, not killing actual flies. My teacher would read out a definition. The first person to slap the correct answer would get to go to the back of their line. The other person, however, had to return to their seat. They were out of the game. This continued until only one team remained standing. The only prize we received for winning was bragging rights, but that always seemed like enough. 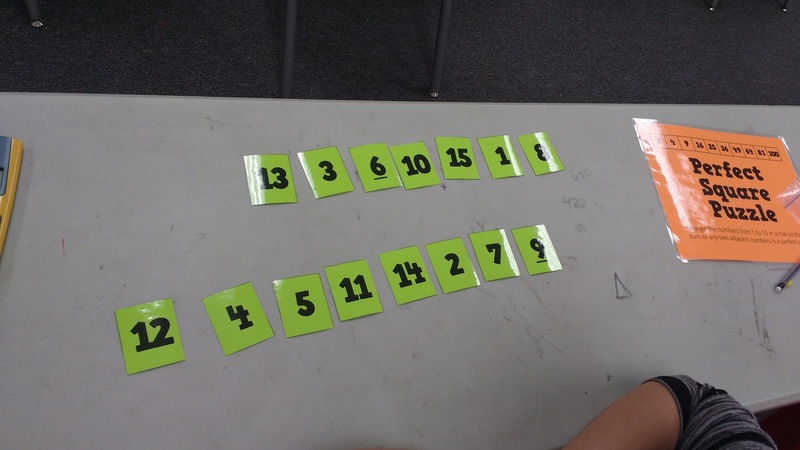 Over the years, I've used this game in my own classroom for various topics. I've blogged about using the flyswatter game for differentiating between the different forms of linear functions and the different forms of quadratic functions and locating points on the coordinate plane. 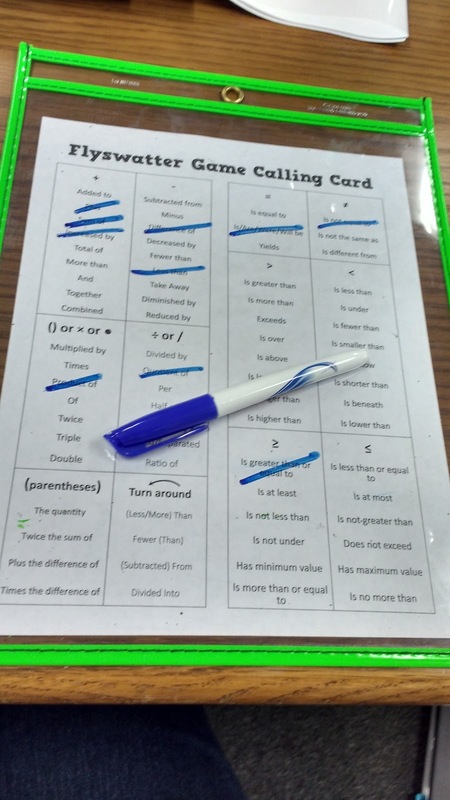 This year, I decided to utilize the flyswatter game to review for our quiz on translating between words and algebra. I printed the various symbols we were translating on colored paper and laminated them for longevity. Here's an action shot as two students race to identify the symbol that means the same thing as "quotient." To keep myself sane while calling out the words, I created a "Calling Card." As I called out each phrase, I marked it off. This meant my students heard a good mix of words. I put it in a dry erase pocket (affiliate link) to make it easily reusable. Now, I did deviate a bit from the way Mrs. Murray taught us to play the flyswatter game. Instead of having two lines of students waiting to play on the dry erase board, I gave each pair a turn to play five or so words at the dry erase board. Then, another pair got a turn. When students weren't playing with the flyswatters on the dry erase board, they got a chance to play with a mini deck of cards at their table. 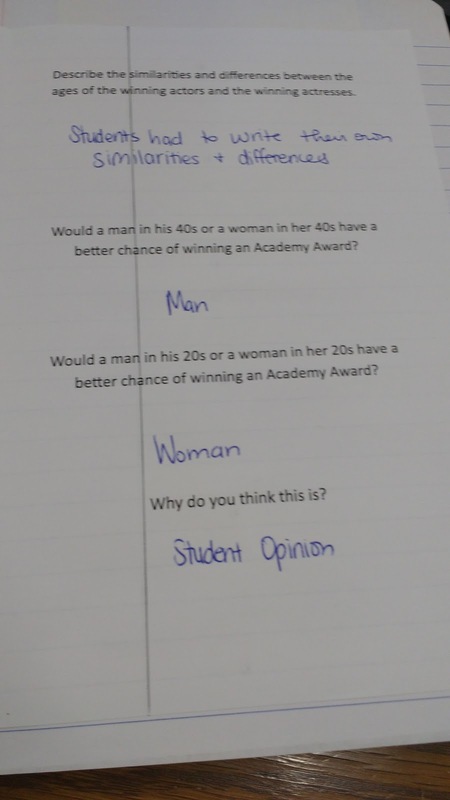 With this version, students had to be the first to slap the correct answer. Some of my Algebra 1 classes can get a bit rowdy, so I wanted to keep every student engaged during the entire game. Having now played this, I would probably make some tweaks to the game. Let's be honest, I'll be making tweaks to my entire approach to teaching translating between words and algebra. It's such a hard topic to teach. My students have finally become confident with their translating, but it has taken over a month of continual practice instead of the week or so that I expected. Throughout our solving equations unit, I have given them their equations in word form such as "Three less than five times a number is equal to negative twenty-three." Students have had to translate it before they can solve it. This continual practice seems to have done the trick. But, I would like to find a way to expedite this learning process in future years. You can download the files for this activity here. Last year was my first year teaching Algebra 1 under the new Oklahoma Academic Standards. Though it was my fifth year of teaching Algebra 1, I had to make quite a few changes due to the difference in standards. 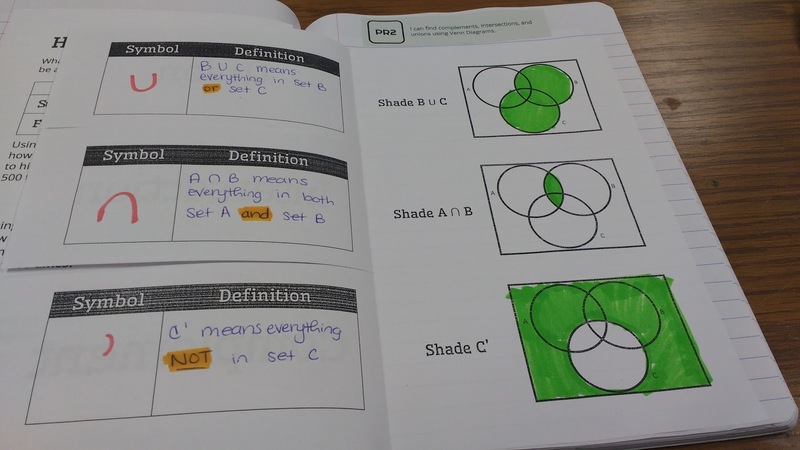 Amidst the craziness of adjusting to new standards, I never got around to blogging all of my interactive notebook pages from last year. 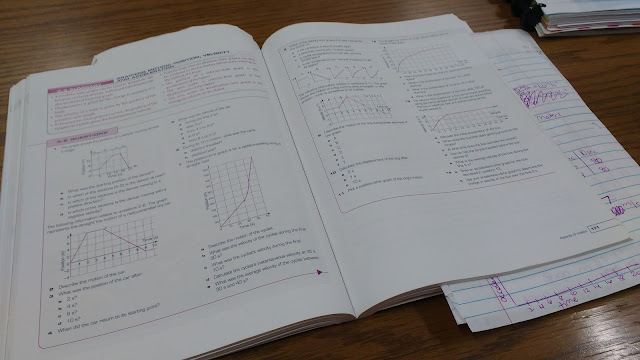 Yesterday, while my Algebra 1 students were taking a quiz over solving absolute value equations, I took out last year's notebook and took a photograph of every page. I have uploaded photos of each notebook page from last year's Algebra 1 class here. There are no explanations of the purpose of various pages. And there are no links to download the pages. Hopefully these will come later. But, I do think this photo album approach does something that my individual blog posts don't. It provides a "big picture" look at what my interactive notebooks end up looking like in the span of a year. Now, I need to say that last year's interactive notebook is NOT perfect. 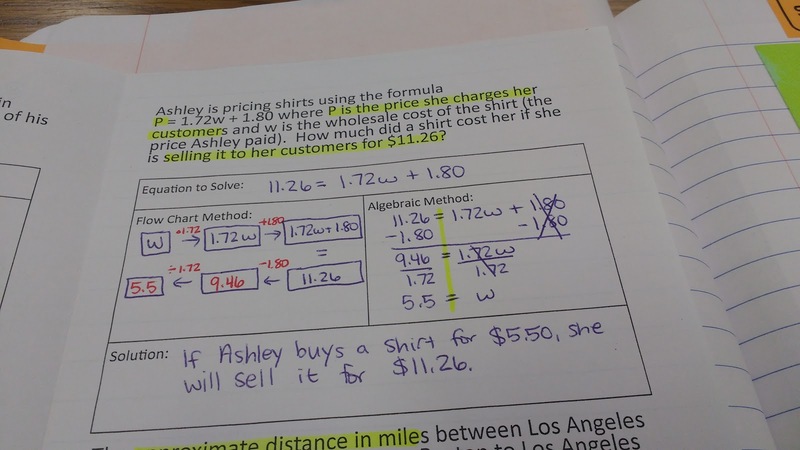 I learned a lot teaching Oklahoma's new Algebra 1 standards last year, and I've already made quite a few changes this year. On top of that, I'm already making a list of MORE changes I want to make next year to make the course flow better and improve conceptual understanding. I hope you enjoy this peek at what an entire Algebra 1 notebook looks like! Check it out here. Lately, I've been finding lots of ideas that I want to blog about that aren't worthy of their own entire post. So, instead of doing anything about these ideas, they've just been lurking in my blog drafts folder. The number of drafts in this folder has finally gotten to me, and I've decided to do something about it! 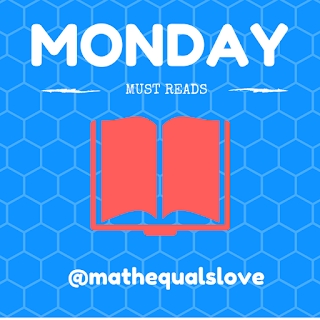 Every Friday, for at least the next few weeks, I will be sharing a blog post of five smaller ideas that I think are worth sharing but are not worthy of their own post. I'm calling this Five Things Friday. 1. I made the news! My hometown newspaper recently published an article about me and my Oklahoma Teacher of the Year journey. If you're interested in learning a bit more about me, you can check out the article here. 2. I used some pretty tape to repair some thermometers. I found some thermometers stuffed in a random box in the science lab of our old high school. 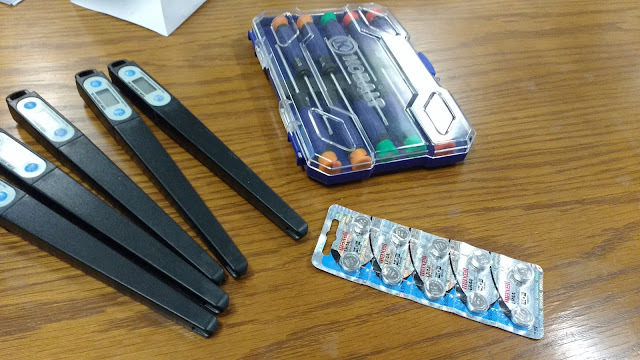 I brought them over to my classroom for my chemistry students to use, but I found that a previous teacher had misplaced the backs to some of the thermometers. After replacing all of the batteries, I took some decorative tape and covered the back of the thermometer. Now they're ready for my students to use! 3. 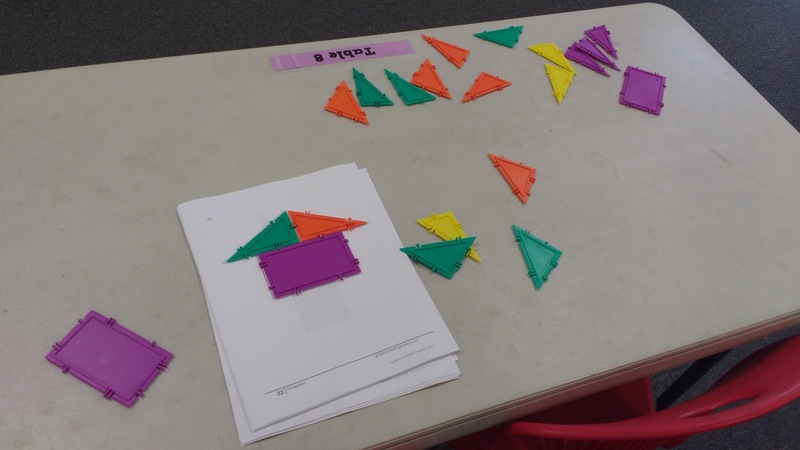 I challenged my students to solve some tangram puzzles using Geometiles (affiliate link). Recently, I was contacted by the kind people at Geometiles to write a review in exchange for a free set of Geometiles. Of course I said yes! 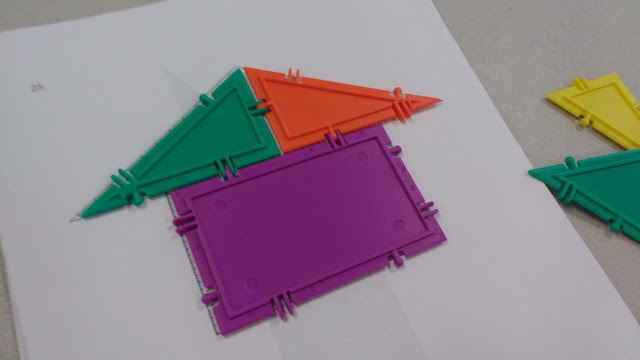 You can check out my indepth review of these awesome math manipulatives here. 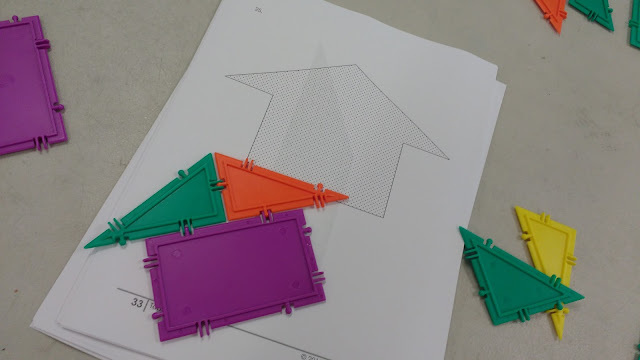 One of the awesome free resources that Geometiles provides teachers is a printable set of tangram puzzles. I printed off these puzzles and set them on a (mostly) unused table in my room. I didn't mention them to my students. Instead, I just waited to see what would happen. 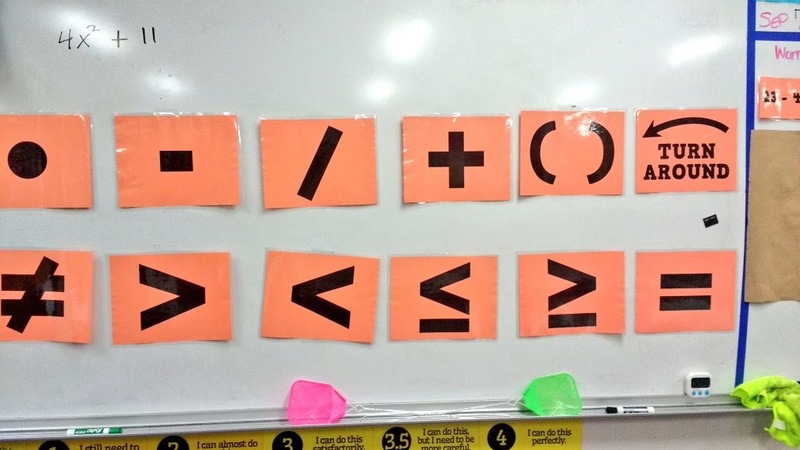 It took a few days for students to start noticing them, but when they did they became obsessed! I love that these puzzles look easy but can actually become quite tricky. Soon, students were rushing to play with the Geometiles whenever they entered the room or finished early. 4. 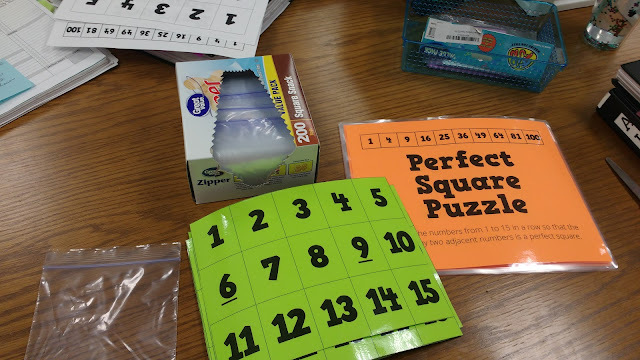 Inspired by my Geometiles experience, I decided to start a "Puzzle Table" in my classroom. After leaving the Geometiles out for about a week, I decided it was time to change it up. 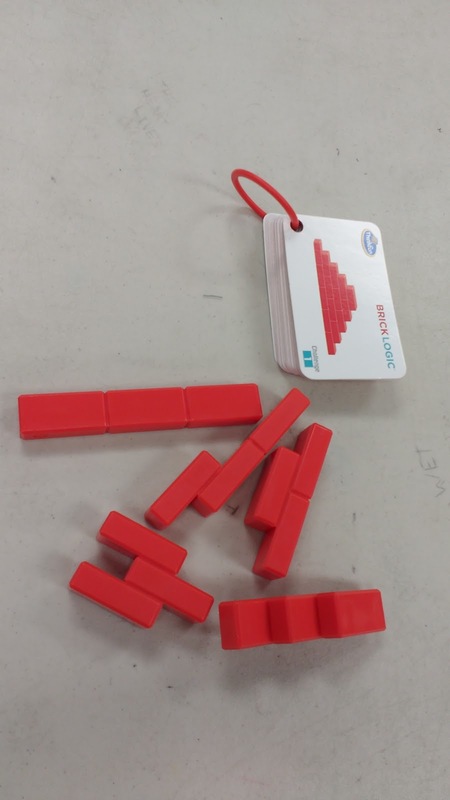 I packed up the Geometiles and pulled out another puzzle for students to play with: ThinkFun's Brick Logic (affiliate link). Never heard of this puzzle? Check out the blog post I wrote about it here. On the first day of having the Brick Logic puzzle out, we had a little mishap. My students informed me that one of the pieces had been lost. We looked all around and couldn't find it. 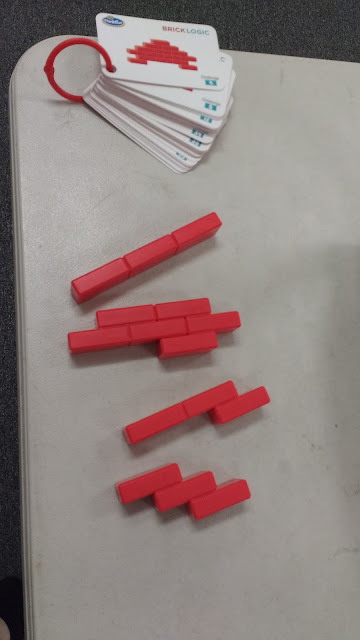 I started to think that this was the end of the puzzle table since one of my students must have walked off with the piece (either intentionally or unintentionally). 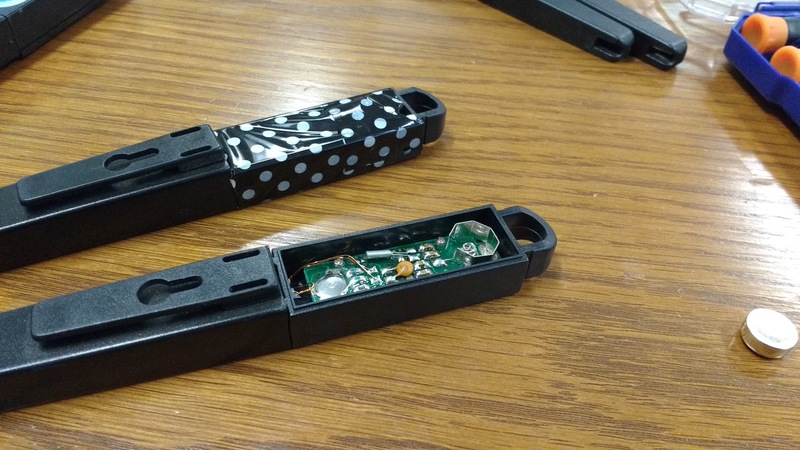 I know I shouldn't assume that a student would steal something, but it wouldn't have been the first time it happened. Sadly, I've had so many things stolen from my classroom over the course of my teaching career. Thankfully, it was just a false alarm. See that second piece from the top? It's actually two pieces stuck together. Mystery solved! This means the puzzle table can live on! Fun Fact: If you do lose a piece to a ThinkFun puzzle, the company will replace it for free if you are a teacher! That's some awesome customer service! 5. I'm teaching myself physics! After earning my chemistry certification last year, I'm now looking towards earning my physics certification. I don't have any real desire (yet) to teach physics, but I love the challenge of learning something new. My physics experience in high school wasn't the most rigorous, so I have A LOT to learn. When we were in Australia this summer, I found my husband's 11th and 12th grade physics textbooks. So I have adopted them as my curriculum. Well, it turns out that I still have posts in my drafts folder from last year. I guess I should do something about that. 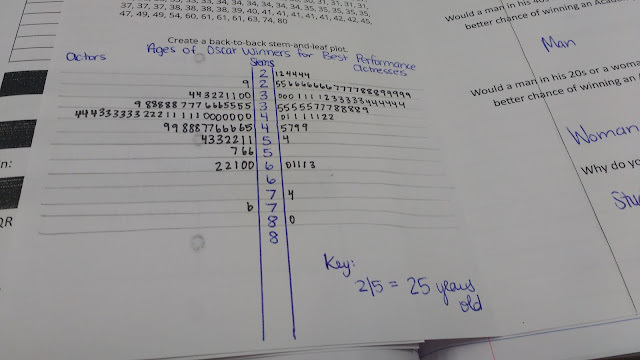 Note to self: Give students a graph paper grid to do this on top of in the future. Their data displays were a MESS. Of all the activities we did in our data analysis unit last year, this one was probably one of my least favorites. It's not that the activity was bad. It just didn't have the enjoyment factor that our other activities had of collecting our own data. So, I'll probably be on the lookout for a different activity for creating back-to-back stem-and-leaf plots for this year. It was really interesting to listen to students share their theories regarding this data, though! If you're interested in the file for this activity, it is uploaded here. In March, my husband and I were impressed by a post by Jo Morgan titled Papers Society. We loved the idea of getting students together outside of class to review. But, we couldn't implement the idea as shared because of two reasons. Oklahoma got rid of the yearly standardized test in math at the high school level. The only standardized our students will take during their high school years will be the ACT, a college entrance exam for non-US readers. Even when we did have a yearly standardized math test, the tests were not released each year. Thus, we don't have past exam papers available for students to study. Still, we wanted to encourage students to stay after school for extra help. We always open our classrooms after school for students to stop by for tutoring, but we tend to get a student or two each afternoon. 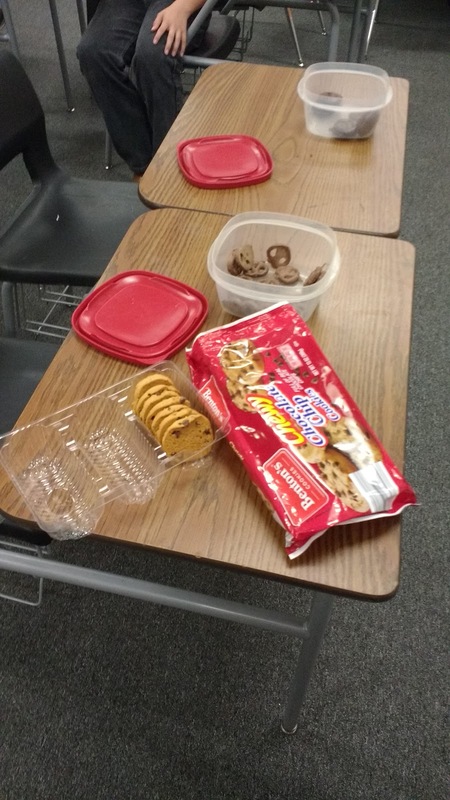 We decided if we designated a certain day of the week for tutoring and provided snacks that we might get a bigger turnout. 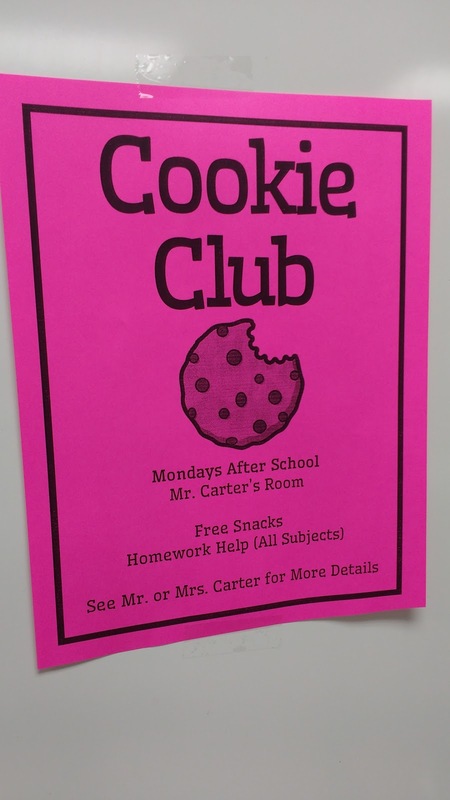 We toyed with a few different names before deciding between "Homework Club" and "Cookie Club." 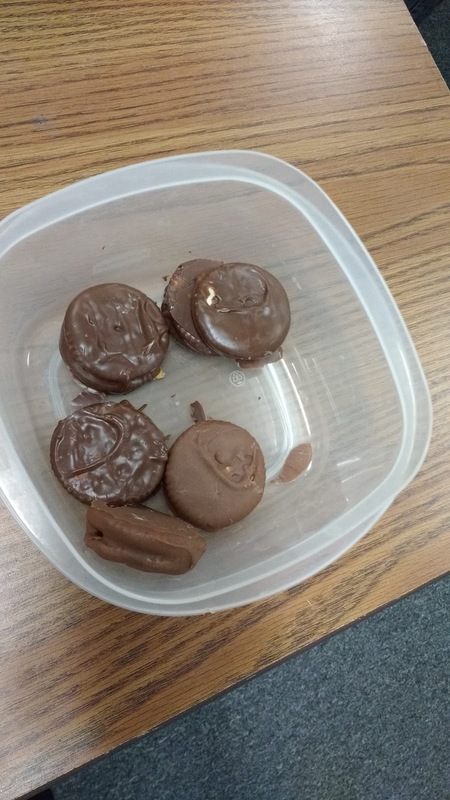 The former sounded a bit dreary, so we settled on Cookie Club. Every Monday, my husband I join together in his classroom to offer homework help and give students a chance to retake quizzes if they need to. So, my Sunday routine now includes baking for Cookie Club. As the weeks have passed on, the number of students showing up has grown. And, I've started stretching the snacks away from cookies only to desserts in general. One week, I made lemon bars. 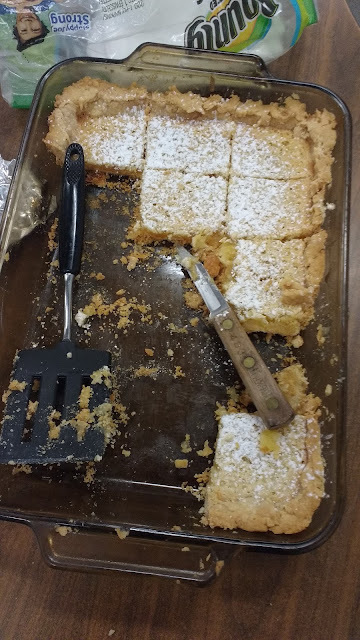 This was a dessert staple in our house, so I was surprised to learn that many of my students had never had a lemon bar before. They declared them a winner! 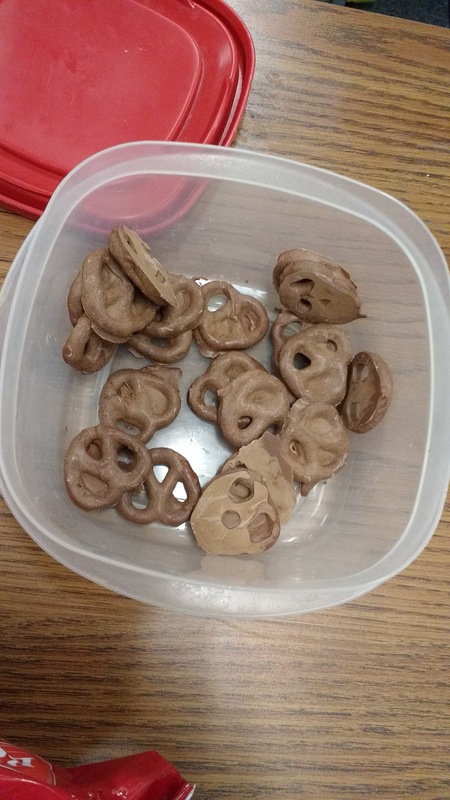 This week, I made chocolate covered peanut butter crackers and chocolate covered pretzels. 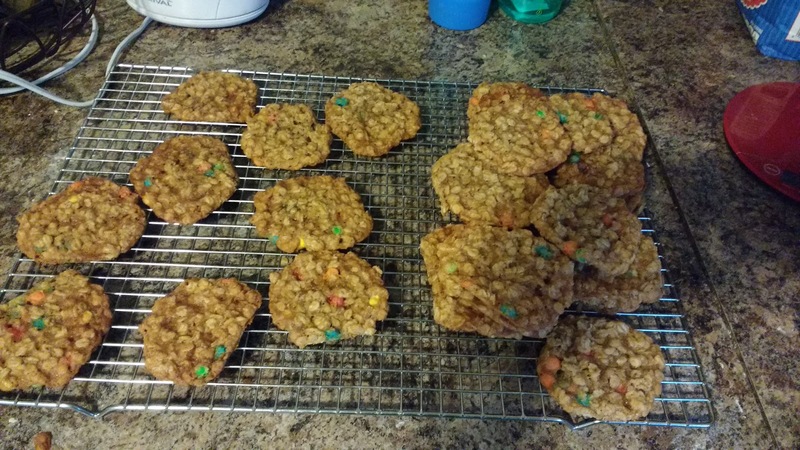 We had even more kids than normal, so we also pulled out a package of store bought cookies. So far, the cookie club experiment has been a success. We look forward to continuing to provide homework help and yummy snacks to our students. Last week, I was browsing twitter and came across a fun puzzle. Place a set of numbers in a row such that adjacent pairs of numbers always sum to a perfect square. I decided to create a version for my students to try who finished their 9 weeks test early. To keep things more manageable, I decided to only use the numbers 1-15 with my students. So, I typed up a set of number cards and a card with the puzzle's instructions. 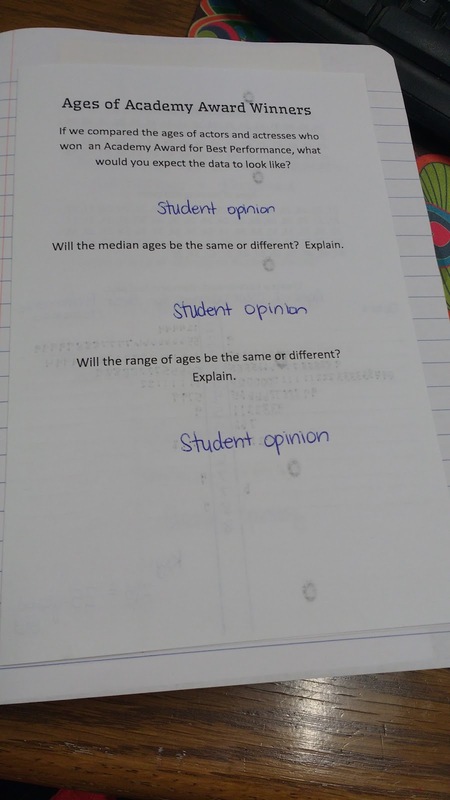 Even though I had typed up the instructions, I found that my students really needed to hear me explain the task aloud for them to grasp what it was asking them to do. Even though they were quick to claim the puzzle was impossible, some students persevered! I have uploaded the file for this activity here.